CABLE HIGHLIGHTS: Fox News naturally dominated cable on Inauguration Day, with every one of the Top 11 telecasts, topped by 1.80/11M for the noon hour when the oath of office was taken. 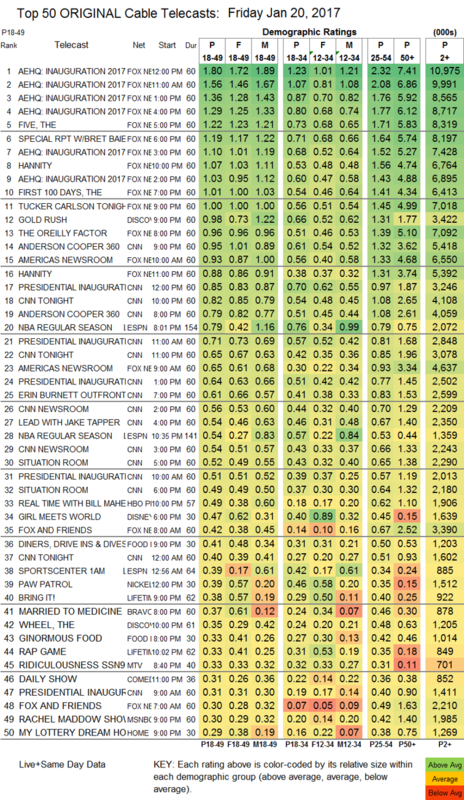 CNN viewers couldn’t bear to watch until 9PM, when the network scored 0.95/5.4M. Beyond the news, Discovery’s GOLD RUSH continued to be the strongest Friday series, down 0.14 to 0.98, and lead-out THE WHEEL was down 0.12 to 0.35. ESPN’s NBA doubleheader included Golden State vs. Houston at 0.79, and Indiana vs. Lakers at 0.54. HBO’s REAL TIME WITH BILL MAHER returned at o.49. Disney Channel’s GIRL MEETS WORLD jumped 0.12 to 0.47. Food Network’s DINERS, DRIVE-INS & DIVES rose 0.03 to 0.41, and GINORMOUS FOOD was down 0.05 to 0.33. 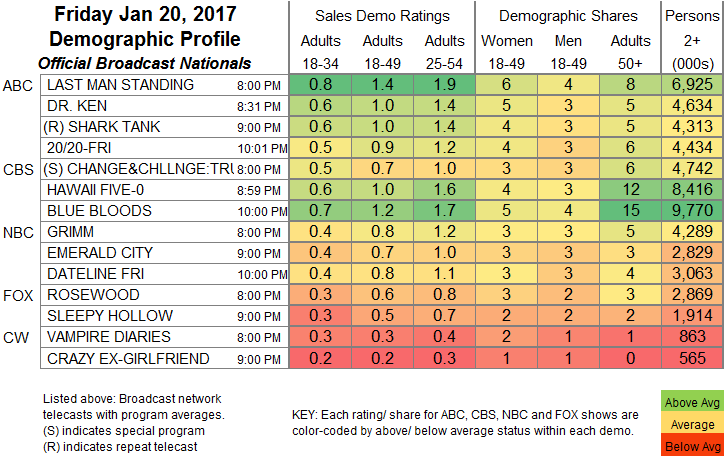 On Lifetime, BRING IT dropped 0.07 to 0.38, and THE RAP GAME was down 0.11 to 0.33. Bravo’s MARRIED TO MEDICINE gained 0.03 to 0.37. MTV’s RIDICULOUSNESS was at 0.33/0.28. A special inauguration episode of Comedy Central’s THE DAILY SHOW was at 0.31. HGTV’s MY LOTTERY DREAM HOUSE was steady at 0.29, and HOUSE HUNTERS INTL was down 0.09 to 0.26. A&E’s LIVE PD fell 0.06 to 0.29. On ID, FORBIDDEN: DYING FOR LOVE dropped 0.04 to 0.31, and WIVES WITH KNIVES was down 0.04 to 0.21. TLC’s PARANORMAL LOCKDOWN ticked down to 0.25, and the AFTER-SHOW was down 0.03 to 0.20. We’s MARRIAGE BOOT CAMP rose 0.02 to 0.18.